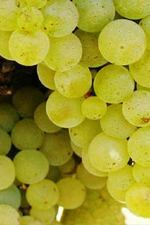 This week on Wine Sediments, I'm talkin' Austrian wine -- more specifically gruner veltliner. Austrian wine has been getting a lot of blog coverage lately, especially with the Live Austrian Wine Adventure ramping up soon, so I just had to throw my two cents in on an awesome gruner I tasted last week. Head on over to Wine Sediments this morning and learn a little about this under-appreciated white. Wine Sediments brings together some of the worlds best wine blogging talent. Even if I weren't writing there, I'd check it out every day. You should too. No. 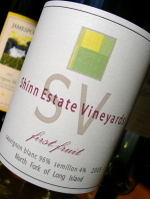 Not for Long Island wine (the first commercial vines were only two years old at that point). 1975 was a very good year for people...particularly those born in Pittsburgh, PA and who eventually move to Long Island, fall in love with a girl and fall in love with a wine region. Yes. I turn 31 today. Not nearly as filled with fanfare as the big three-oh from last year, but a birthday nonetheless. 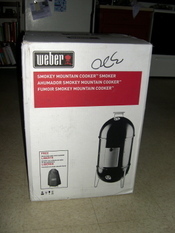 As I mentioned a while ago, Nena and my parents bought me a smoker for my birthday. 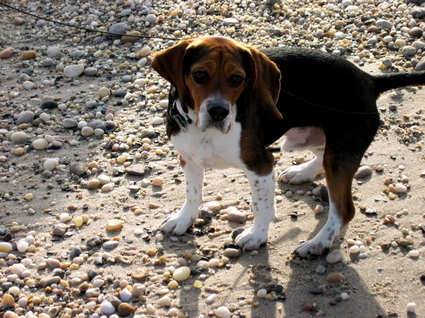 And last night Ben (yes, our beagle) gave me Bruce Aidells's Complete Book of Pork and The Bakyard Vintner. I have a suspicious feeling that Nena may have been involved in the purchase. This Saturday, with some advice from Robert, I'll be firing up my smoker for the first time. The target meat? Spare ribs. Beyond that, it promises to be a quiet birthday. Nena has dress rehearsal tonight for her group's performance of more Aaron Copland Friday night, so it will just be me, Ben and my laptop tonight...which is good because I have a lot of writing projects to get caught up on. A quiet birthday also means that I've successfully avoided the corporate cake/small talk festival that everyone gets here around 3 p.m. Luckily, my friends here at the office know that I dislike such activities and have kept my birthday somewhat on the down low today. I'm thankful. The Internet's premier food blogging event, Is My Blog Burning? has inspired an ever-growing number of culinary blog events, including the world's most popular virtual wine tasting Wine Blogging Wednesday. So, it was only a matter of time before the two culinary juggernauts joined forces to create the ultimate culinary blogging event. It is with great pleasure and excitement that IMBB's founder, Alberto and I announce that we are co-hosting the May editions of IMBB and WBW. It's the Fabulous Favorites Festival and it's taking place on Friday May 19 on a blog near you. What is the Fabulous Favorites Festival exactly? It's a food and wine pairing event that, we hope, will attract the largest group of participants ever for any culinary blog event. For this one day at least, food bloggers will be "forced" to dive into the wine pool, while wine bloggers will have to uncork their cooking skills. The concept is simple, with two plans of attack you can choose from. Pick a favorite bottle of wine from your cellar and create/cook a dish that goes with it. Pick a favorite dish in your culinary repertoire and seek out a wine that will pair will it. Or, if you're feeling really ambitious, create an entire wine-pairing menu of favorites. Alberto and I are both excited about this joint-venture...and we hope you are too. I have an announcement to make: I have a new favorite local red wine for every day, food-friendly drinking. Light-to-medium bodied, this wine actually has some pinot noir-like qualities despite the grapes involved. Light ruby in the glass, the nose is mainly raspberry and strawberries, with just the most subtle hints of spice. The palate is juicy red berries, hints of oak character, and terrific food-friendly acidity that is what makes this wine so charming. It's not really non-vintage (all of the grapes came from 2004) but they want to keep their options open for future releases. I can only assume the same is true with the name -- at 75% merlot, they could legally label it merlot. For quite a while now, I've toyed with the idea of becoming a home winemaker. Time isn't exactly something I have a surplus of these days, but making and bottling my own vino is something I think would be such an amazing process. But, instead of going out and buying so-so home winemaking equipment and blindly working my way through the fermentation process with purchased juice or concentrate I'm taking it one step further. LENNDEVOURS contributor Richard Olsen-Harbich, who also happens to be the managing director and winemaker for Raphael, one of Long Island's premier merlot makers, has offered to let me adopt 25 cabernet franc for the season. The vines are nine years old, planted in 1997. Obviously I've already missed pruning season, but it is my plan to visit "my" vines as much as possible and chronicle their growth, development etc. throughout the growing season. But that's not all. Come harvest time, I plan to pick the grapes myself, stomp them and make wine out of them...all under the tutelage of Rich in Raphael's winery. 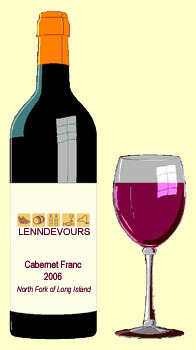 We'll probably make 3-4 cases of 2006 cabernet franc, tentatively scheduled for release in June or July of 2007. Of course, you, my readers, will be there with me every step of the way. I'm hoping to get out to Peconic either this weekend or next to take pictures of my adopted vines. I'd like to make a white wine too, but I think maybe I'll stick with the cab franc this year. I'd tell you to reserve your bottle today, but I expect this vintage to sell out to my ultra-exclusive wine club withing hours of its release. This will be a cult bottling priced at, say, $425 per bottle. Voluptuous, muscular, fat, brooding, sultry…for hundreds of years, descriptors of the human condition have been used to define the flavors and experience of wine. With the advent of political correctness, some of these descriptors (like “feminine” and “masculine”) have lost favor, giving way to more literal references. What has not changed however is the way that wine can be compared to people. When I speak about wine I often use sociological analogies. That's nothing new -- vineyards and wine have been used to tell stories about people since biblical times. It’s often a good way to help folks understand wine -- and themselves. Consider a new vineyard: Grape vines have the same average life span as humans -- approximately 70-80 years. Early in life, young vines are precocious and can produce a great deal of fruit, resulting in vibrant and fresh wines that usually fade relatively quickly. Young vines needs lots of training and guidance to achieve a level of moderation. Conversely, older vines tend to decline in output in their latter years, yet can produce quality fruit and wines that are profound and deep, with great aging potential (seniors love hearing that one). Grown and raised well, vines and people will last longer and produce better results over the long term. Mismanaged, neglected and abused, both can produce inferior results and come to a premature end. The issue of terroir is one that becomes much clearer when discussing it in human terms. Vines, like people, will react to the conditions in which they are being raised -- both environmental and manmade. Both are biologically the same the world over. Yet when grown and raised in different places, they can take on the characteristics only found in that area. For people it is language, accents, customs and mannerisms. For vines it's flavor, aroma and body. Over very long periods of time, both will begin to genetically evolve to become more suited to their surroundings. Today on The Gilded Fork, Chef Mark Tafoya presents a delicious and delectable dinner menu for Mother's Day and I've contributed wine pairings for each course. Yes, I focused on Long Island wines, but I gave enough direction to help even those unaware of the tasty local wines I love so much. Of course, if you're reading this post...you're well aware. Check it out and spoil mom this year. In the midst of our more-work-than-I-ever-expected bathroom renovation project, my parents and lovely wife presented me with my birthday present (a bit early, but I'm not complaining) -- a Weber Smokey Mountain Cooker. I can barely contain my excitement as I think about all of the delicious pork I'll be cooking on it this summer...ribs...shoulder....belly for bacon. I look forward to experimenting with this bad boy...and you'd better believe that I'll chronicle my experiments here on LENNDEVOURS. As of last weekend, my favorite Long Island pinot noir producer, Castello di Borghese in Cutchogue, went on the market for $9.2 million. The entire estate is included — 85 acres (25 planted with vines), winery, tasting room, warehouse and beautiful family farmhouse. Before current owners Marco and Ann Marie Borghese bought the property in 1999, the property was known as Hargrave Vineyard — Long Island's first commercial vineyard, founded in 1973 by Alex and Louisa Hargrave. The Borgheses bought the vineyard and winery for $4 million. When I asked Ann Marie what made her and her husband, an Italian prince, decide to put the property on the market, she answered simply "Marco and I are following our initial plan which was to be here until the children graduated high school and now we are structuring our next phase. The vineyard is for sale and with the time it takes to conclude this type of transaction we are starting the sequence." Apparently neither her son nor daughter have any interest in taking over the family business. Maybe they'd be interested in adopting a local wine writer and letting him take over? Apparently there are several parties already interested in the property, but as rumors swirled leading up to last weekend, the Borghese's winemaker Stan Schumacher resigned. 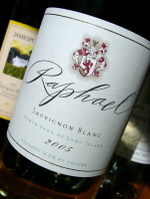 Raphael's 2005 Sauvignon Blanc ($22) is similar in color, but unquestionably different. 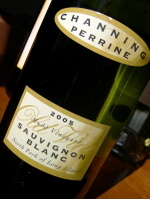 Winemaker Richard Olsen-Harbich has long lauded Sauvignon Blanc as Long Island’s best white grape and he makes his in a distinctive Long Island style — not quite Old Word, but not quite New Zealand either. The nose offers scents of grapefruit, lemons and minerals and the palate offers similar flavors along with more tropical notes of kiwi and melon, with a slatey finish and even more acidity. I’ve tasted three or four vintages of this wine, and this is Rich’s best to date. 2005 really was a great year, even for whites. All of these wines reinforce that notion. Oh boy. How sad is it that the founder of WBW missed his own event? 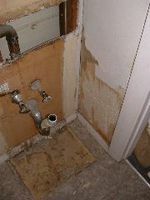 Blame it on a much-more-damaged-than-we-thought subfloor in our bathroom (see pictures). It took us almost a whole day just to get the subfloor stablized enough to start the project. So, I'm a couple days behind on this renovation and WBW passed me by. 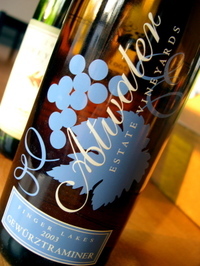 But, we did drink the wine for the event, a bottle of Atwater Estate Vineyards 2003 Gewurtztraminer ($18). It was consumed over a quick dinner in the middle of work...so I don't have full notes this time around. But, it's an easy-drinking style gewurtz (Nena liked it and she usually doesn't like gewurz) that seemed to have just a touch of residual sugar. I like this wine as well...but I prefer my gewurtz bone dry, racy and spicy. ...but this week, I'll be tackling our bathroom. I apologize in advance if I don't post much to LENNDEVOURS this week, but I'm sure you'll understand. We're ripping out the tile/toilet/sink in our bathroom and replacing it all, tiling the shower walls and putting up wainscoting in there too. Did I mention that I am much more comfortable with a corkscrew or chef's knife than I am anything you can find at the hardware store? Luckily, Len Sr. (along with Mamma LENNDEVOURS) will be visiting this week to help. You see, my dad is quite handy...but those talents didn't make the generational trip. The sink and tile are gone already. I ripped them out last night -- no talent involved there. And tonight we're going to get the backerboard put up on the floor and the walls (I hope). Because of a couple 24-hour 'curing' times in the tiling process, we'll be without facilities for a couple days. Thus, we'll be at a local hotel that may or may not have WiFi. Wish me luck...it's going to be a busy week. But, don't think for a second that I won't be participating in WBW! And no, this isn't really a picture of our bathroom, but I will post some as the work progresses. Don't forget, Wine Blogging Wednesday #20 is tomorrow, so head out, get those non-chardonnay/sauvignon blanc/riesling whites and join in on the fun. Given some of our usual participants, it should be interesting to see what obscure varieties they come up with. I guess I could re-purpose my piece on Seyval Blanc and Vidal Blanc from Wine Sediments. But what fun is that? Instead, I think I'll taste a few New York gewurtztraminers. Check back tomorrow to find out. From my very first of their richly Burgundian 2001 Chardonnay last summer, I’ve been a Sherwood House Vineyards enthusiast. Owners Charles and Barbara Smithen, along with winemaker Gilles Martin (of Martha Clara Vineyards), share a devotion to graceful, Old World-style wines that really comes through in the bottle. Next week, Sherwood House Vineyards’ cozy little tasting room will re-open for 2006 and to celebrate, they are releasing three new wines — two from the 2002 vintage and one from 2003. The differences between the 2001 and 2002 growing seasons (2001 was hotter) are apparent, but these 2002 wines are no less charming. 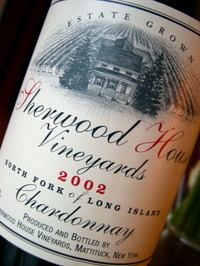 Starting with the 2002 wines, the Sherwood House 2002 Chardonnay ($20) is a striking light gold in the glass. The nose seems less intense than the 2001 but features similar aromas — pear, sweet toasty oak and citrus hints. Medium-full bodied, the texture is somewhat creamy with nicely balanced flavors of pear, toasty marshmallows and oak nuance. I would have liked perhaps a touch more acidity, but this is an extremely stylish Chardonnay that certainly carries on Sherwood House’s white Burgundy tradition. Lobster seems the ideal accompaniment. Sherwood House Vineyards 2002 Merlot ($24) shows a similar, vintage-related dip in ripeness and concentration, but delivers an enchanting mélange of raspberry, cherry and wet stone on the nose — with nearly identical flavors carrying over in the mouth. 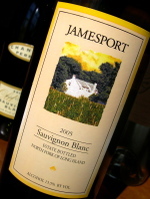 This wine is medium bodied, features sultry, super-fine tannins that that give way to a vanilla inflected finish. Winemaker Martin didn’t overdo the oak — an excellent choice. His restraint is the key to this wine's length and overall quality. Pour this wine along side roast turkey or pork dishes. Stylistically, Long Island Cabernet Franc is all over the map, with seemingly every winery having its own interpretation or style. Some are light and fruity, some are spicier, some are hefty and brooding. Sherwood House Vineyards 2003 ($24), their first Cabernet Franc release, is decidedly less fruity than most local renditions. While a little less aromatic than some Cabernet Franc, its nose presents plums and smoke with a touch of fresh herbs in the mix. Medium-to-light bodied, plum flavors are accented by smoky oak influence and black pepper notes. 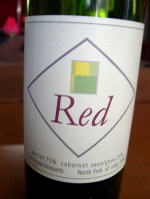 Though perhaps a little pricey for your next barbeque, this red is a nice pairing to grilled meats. Sherwood House Vineyard’s tasting room is located north of Route 48 on Elijah’s Lane, and will open April 15. Keep an eye out for Rufus and Raven the Smithen’s vineyard dogs. For more information on Sherwood House Vineyards, visit www.sherwoodhousevineyards.com or call 298-2157. Long before becoming a huge, raging wine geek, I was well on my way to beer geekdom. While my fraternity brothers were knocking back cases of cheap beer (Keystone Ice and Milwaukee's Best were favorites) I would scrape together every last nickel I could and buy whatever obscure microbrew I could find at the local beer distributor. I still enjoy good, artisanal-style beers on occasion, especially those from local producers like Southampton Publick House and Oomegang Brewery and that's why I'm interested in the Long Island Beer Festival, which is being held on May 12 from 6:00 - 10:00 p.m. at the Huntington Hilton in Melville, NY. For $45, you get unlimited beer samples and food from a bunch of great breweries and restaurants as well as live music and guest speakers like guest speakers including Garrett Oliver brewer of Brooklyn Brewery and Phil Markowski from Southampton Publick House. Best of all, proceeds go to North Shore Animal League, the largest no-kill animal shelter in the world. Plus, designated driver tickets will be available for $10 at the door. Get your tickets...and make sure you find one of those designated drivers. On Wednesday, May 3 at 6:30 p.m. The Gatsby in Islip, New York will serve a four-course dinner paired with the Tuscan wines of Banfi Vinters. The cost is $75 per person. Reservations can be made by calling The Gatsby directly at 631-581-1900. I've never been to The Gatsby. In fact, the last time I was in the building, it was a Chinese buffet named Tang's at least five years ago when my office was right around the corner. 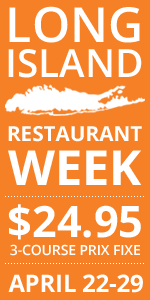 In recent years, however, I've heard many great things about the restaurant, and I'll be there for this event. As focused as I am on New York wines here on LENNDEVOURS, my buddy Beau over at BasicJuice is focused on not being focused. To call the man's wine tastes eclectic would be akin to saying I kinda like my local juice. One thing he and I have in common, however (along with the desire to bring wine to more people and de-snobberize the stuff) is that we like to bring our readers cool stuff. Here I was, thinking that my 50 in 50 project was pretty cool...and then Beau had to go and plan a trip to Austria to explore the wines there. Of course, I'm just as excited as everyone else to see what he finds, tastes and learns. My experience with Austrian wines is limited to a few Gruners...so this should be educational. Just a friendly reminder that Wine Blogging Wednesday #20 is a week from today on April 12. Hosted by Wine for Newbies, this edition of everyone's favorite wine blogging event will force us away from the usual white wines -- you know, chardonnay, sauvignon blanc and riesling. 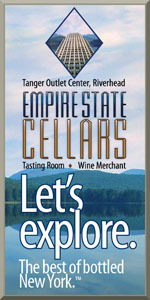 I'll be drinking some NY wines (stop the presses) probably gewurtztraminer but I haven't quite decided just yet. 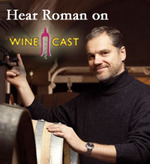 Long Island wine has finally made its way onto the wine podcasting scene with Tim Elliott's Winecast 56, which features an interview with Roman Roth, winemaker and general manager at Wolffer Estate in the Hamptons. Roman is one of my favorite people in the local wine industry, with an interesting, diverse background and a firm dedication Long Island's unique terroir. Tim tasted three chardonnays and three merlots from Wolffer as well. So yesterday I took a rare work-week trip into NYC for the Long Island Merlot Alliance's pre-release party for 2004 Merliance, a 100% merlot wine made from the best lots from the participating wineries. More on the wine and the event later this week. Today we're focusing on my lunch. 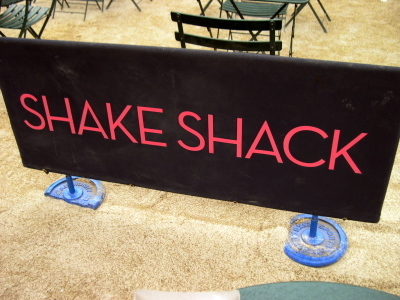 I've read about Shake Shack a few times, mostly on blogs. But, when Frank Bruni wrote about it reopening for the spring a while back, I decided it was time to make my own visit. Of course, what started off as a beautiful day on eastern Long Island gradually got grey and then darker grey as I travelled into the city via train. By the time I actually got to Shake Shack, it was drizzling rather steadily. But, that was too my advantage as the line was much shorter than it would have been. I enjoyed a shack burger, cheese fries and a glass of Trevor Jones Shiraz. The burger: awesome. Flavorful, nicely cooked to medium/medium-rare. The fries: not bad. With the drizzle they got soggy almost instantly (yes, I still ate outside, they don't have anywhere else! The wine: good. They served it a bit too cold for my liking (almost chilled really) but I'd prefer that to warm. Didn't take notes, but it was a typical Aussie shiraz...but a little less jammy and with flavors beyond the regular fruit.